Clean & sanitize ALL equipment that will come into contact with juice & wine immediately prior to starting your wine. Day 1: Most critical step – most problems occur here! Ensure kits are kept at room temperature to help regulate proper fermentation temperature. Add bentonite (Package #1) to warm water, if so instructed, to primary fermenter (PF); stir thoroughly until there are no more clumps. Use a cap remover to remove cap on wine kit bladder to ensure a clean open. Open bladder and pour content into primary fermenter. The bladder can be very heavy. Pour with one hand holding the spout and the other hand holding the bottom of the bladder. Pour lukewarm water into bladder to rinse any leftover concentrate and then pour into primary fermenter, and stir thoroughly. Note: Do NOT rinse the bladder where the concentrate is not reconstituted, e.g. in dessert wine style kits, 23L liter pail product (Premier Cru) or Mivino. Add fresh, clean water and top up to required volume, e.g. 23 L, and stir thoroughly. Water can be used to regulate proper starting temperature of the must. Insert a sanitized thermometer into the juice; temperature should be in the range 20°–25°C (68°–77°F) before you inoculate with yeast. Measure and record the specific gravity and temperature. Record starting date and date code and place the white peel off sticker onto your instruction sheet. Note: Ensure that you thoroughly mix the primary fermenter prior to measuring the specific gravity. Note: the top of the box has a peelable date code sticker for recording ease. Add other ingredients such as grape skins, oak, raisins etc as instructed and stir thoroughly. 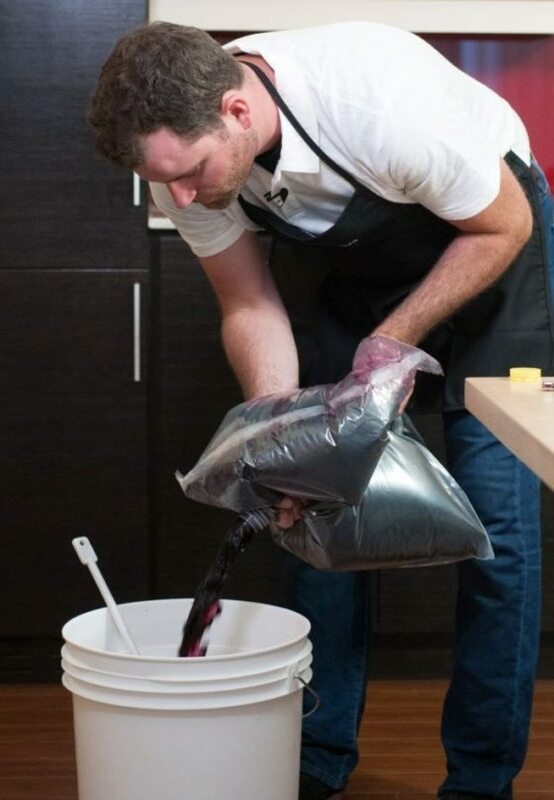 Be sure to clean/sanitize the straining bag in kits supplied with grape skins by dipping straining bag in boiling water. Customer can now inoculate the yeast by sprinkling onto the top of the juice without stirring. Once yeast has been sprinkled into the juice do not move primary fermenter as this can prevent the yeast from hydrating itself properly. Sanitize the lid and place on the primary fermenter. Fermentation should start within 24–36 hours; you should see foaming/bubbling at the surface of the must (now becoming wine). It is CRUCIAL that you check to ensure fermentation is started. Refer to troubleshooting section if fermentation does not begin. It’s important to maintain surrounding area within the range 20°–25°C (68°–77°F). As fermentation picks up and becomes vigorous, you will see a lot of foaming. 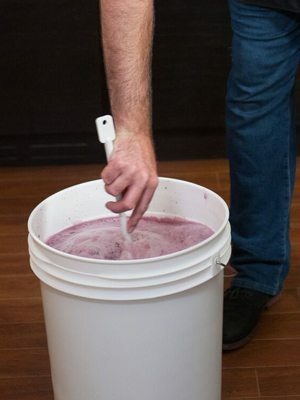 Optionally, stirring the fermenting wine twice daily using a sanitized long-handle spoon promotes a good fermentation. Do NOT be tempted to open lid more often than necessary; the CO2 produced from fermentation is protecting your wine from spoilage effects. Monitor fermentation progress by measuring and recording the SG once daily. 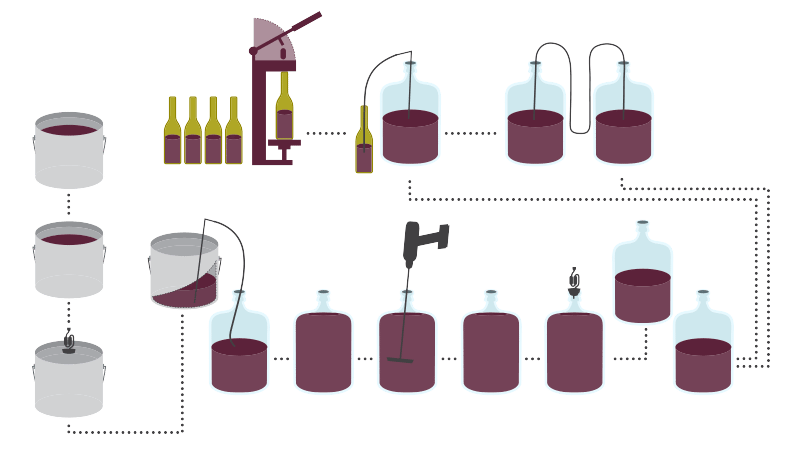 Once primary fermentation has reached the SG indicated in the kit, your wine is ready to move to the next step. In SINGLE-stage fermentations, the AF is complete and you will need to rack the wine from the primary fermenter (e.g. 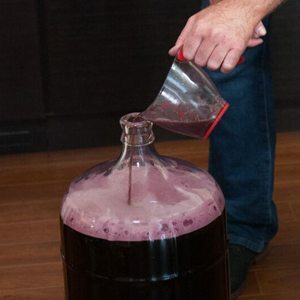 pail) to a carboy, and proceed to degassing, stabilizing and clearing the wine. In DOUBLE-stage fermentations, i.e. in kits with grape skins, the AF is NOT yet complete. You will need to rack the wine from the primary fermenter (e.g. pail) to a secondary fermenter (i.e. carboy) to let AF complete to the SG indicated in the kit. If your kit came with GenuWine Wet Grapeskins please remove them now. If your kit came with GenuWine Dried Grapeskins you can leave them in for an additional 7 days or until the S.G has reached 0.998 or below. Retrieve a wine sample and measure/record the SG. Once secondary fermentation has reached the SG indicated in the kit (e.g. 0.998 ) ,your wine is ready to proceed to stabilization and clearing. Degassing – Day 14 (approx.). Once your wine has reached its target S.G (refer to your instructions) rack your wine from the primary fermenter into a 23L (6 US Gal) carboy. Degas the wine using either a sanitized spoon, drill mounted fizz-x tool or a vacuum system. 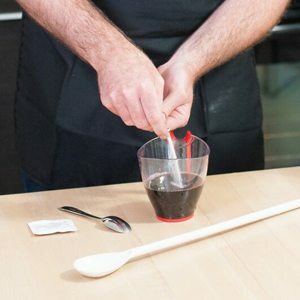 If using the spoon or fizz-x method each wine will need between 3 and 5 minutes of degassing. 1) Add the Kieselsol (package # D1) and stir thoroughly for 30 seconds. 3) Add the chitosan (package # D2) and stir thoroughly for 30 seconds. Once your wine has been thoroughly degassed please proceed with stabilizing your wine. Dissolve the required amount of sulphite (Package #2A) and Potassium Sorbate (Package #2B) in a small amount of wine and add to the carboy. Once dissolved solution is added to the wine mix gently for 30 seconds. 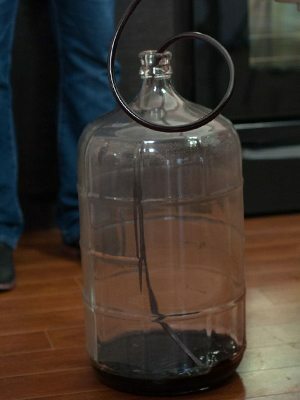 Top up the carboy with a similar stylewine, if required, to within 2 inches of the airlock. Place the bung/airlock on the carboy. Ideally place the carboy in a dark, cool area with °T in the range of 13–18°C (55–65°F). Please note that different temperatures are required for fermentation versus clearing. Log all operations and any observations. Clean primary fermenter & racking equipment and store away. Let the wine clarify for the length of time as per kit instructions. The wine should completely clear before moving onto filtering. Wine can be tested by shining a bright flashlight through the carboy in a dark room. If you see suspended material, the wine is not clear. Filter wine to avoid sediment in bottles, even in a crystal clear wine. Filtering in a Craft Winemaking environment is highly recommended. Once the wine has completely cleared, rack into a sanitized carboy. Note that if the wine doesnt need to be moved, there is no need to rack it if the filtration process is done carefully to not disturb sediment. Best to filter at as close to 20°C (68°F) as possible. 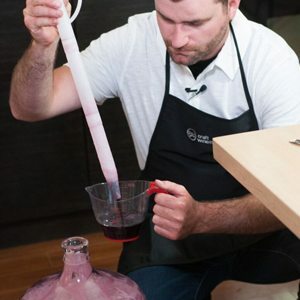 The Buno Vino Mini Jet filter is an excellent option for at home winemakers. The entire system must be rinsed and sanitized prior to filtering wine. Filter pads should always be sanitized prior to use whether they have been stored in their original packagaing or not. Pour approximately 10 L (2.5 gal) of fresh, clean water in a clean pail. To this 10L of water add 2 tsp of sulphite and 10 tsp of citric acid. This solution will negatively charge your filter pads helping to remove more haze/sediment causing proteins from the wine while also sanitizing the filter pads. Dip all filter pads into this sulfite/citric acid solution and let pads soak for 5 minutes. Once pads have been soaked place into your filter following the manufacturer’s instructions. Be sure to properly orient & align pads as per manufacturer’s instructions; wine should always flow into the coarse side of pads. Complete installing filter plates and secure tightly. Connect pump and filtration equipment as per desired configuration. Circulate this 10L of sulfite/citric acid solution through the filter for 2-3 minutes. Flush the system with 5 liters of cold clean water. Your system is now ready to filter wine. NOTE: Never mix pads of different grades. Double check your setup before turning power on. 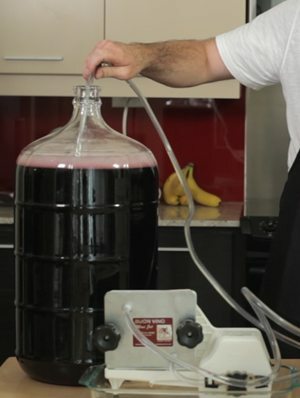 Filter wine into a sanitized carboy; monitor pressure (or wine flow if there is no gauge) to ensure that pads are not clogging. You can discard the first little water out of the filtration system. It is normal to see a little wine leakage from filter unit. Do NOT turn pump ON/OFF/ON during filtration; this may affect filtration efficiency and wine clarity. Discard pads at the end of filtration. Always filter white wines before red, & dry before sweet! And filter Orchard Breezin’ wines separately as they will add flavours to other wines. If you are aging your wine for longer than 6 months, add ¼ tsp of extra sulphite to the receiving carboy. Clean all filtration equipment with a Sani-Brew Solution and store away. Assemble the required number of CLEAN bottles, e.g. 30 bottles for a 23-L batch. Sanitize each bottle using the sulphiter and a 5% sulphite solution (2 ½ TBSP per 1L water). After sanitizing each bottle with 5% sulphite solution allow to drip dry for 5 minutes on bottle tree. Have corks and corker ready. Remember to use corks that have been properly stored! 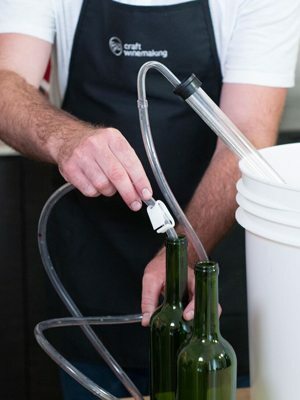 Using your preferred bottling equipment, bottle the wine; fill to within ½ inch of the bottom of the cork. 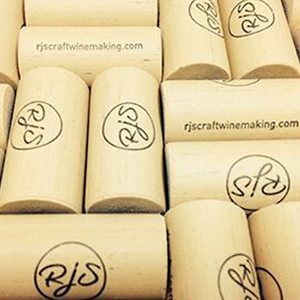 Cork each bottle immediately, minimizing any exposure to air and the environment. Only use clean or washed/sanitized bottles. Do NOT soak corks; there is no need, especially with a good corker. Ensure corks are stored in an air tight container and not exposed to the open air. Pressure wash all bottles with warm water; tap pressure is fine.